The swell and breaking waves seemed to come from every possible direction as the wind picked up and the tide dropped - it was already a stormy day that looked more menacing by the minute. Kelly and Tree chose steep drops on waves breaking right by the exposed, seaweed coated Mushroom Rock. 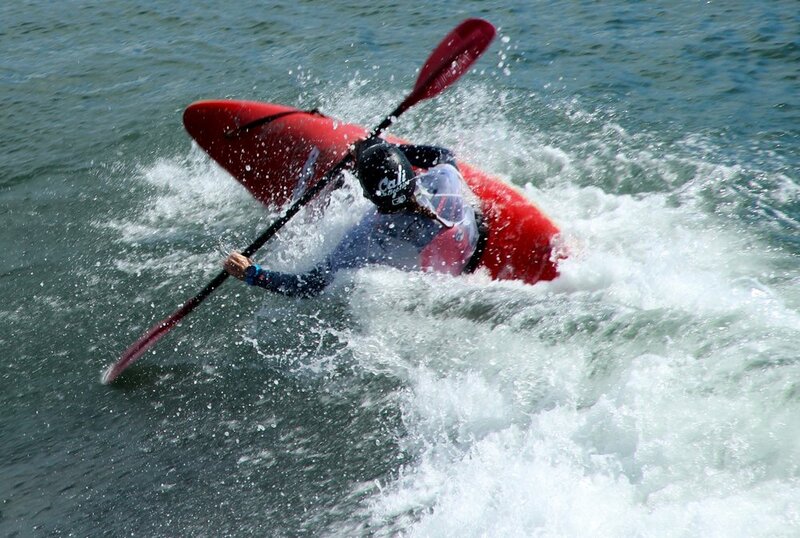 Squeezed into one of Kelly’s surf kayaks, I could no longer feel my feet despite removing a ton of foam from the bow. I looked at Greg and asked, “Okay, I guess we start catching waves?” He shook his head and then then built up the courage to surf one. The Surfline forecast predicted a 3-5 foot day, instead the waves were more like a blustery 6-9 feet. After watching Kelly take another steep take off right by the rock, I saw her several attempts to roll as a large set pounded her upside down hull dragging her upside down. I was in over my head and ready to try and catch the smallest wave in the set I could find just to shake the fear. Right as I mustered the courage to catch a wave, a large set came through before I could paddle further outside. One really large one caught me as I back surfed for about 5 seconds (which felt like flying and was, in hindsight, fun) before the wave steepened and flipped my boat end over end. I waited upside down, feeling the pull of the undertow weaken, then tried roll attempt one. Fail. Then roll attempt two. Another fail. On my second attempt, I caught a glimpse of the next wave about to break on top of me. Instead of holding my breath and waiting, I decided to bail. I wiggled out of the kayak right before the wave broke on me and held onto the boat as we both got dragged a bit. I felt so embarrassed. I hadn’t swum in years and it hurt my pride to wet exit after only trying twice when I encourage my roll students to try three, four, sometimes five times before giving up. Kelly performed a great deep water rescue because we were a good quarter mile from shore and I wiggled back into my kayak and practiced rolling again while Tree spotted me - this time successfully. In one way, I felt relieved: the worst that could happen kinda happened and I was fine. The conditions were deteriorating and we all decided to paddle back to Mavericks Beach together. Greg and I caught some smaller waves closer to the beach and I felt my courage come back, just barely. Once on shore while emptying the remaining water from the kayak, I thought to myself: maybe I’m just not meant to do this.